Technical Report on Container Security (IV)-5 - NSFOCUS, Inc., a global network and cyber security leader, protects enterprises and carriers from advanced cyber attacks. Isolation and access control are two major protection means for computer networks. This section uses host networks in bridge mode and cluster networks in overlay mode as examples to discuss how these security mechanisms are implemented. In general, container networks are isolated by using the network namespace technology and iptables, while access control mainly depends on iptables. From the preceding command output, you can see that test‘s network bridge is br-bff064219957. After this network is set up, Docker will add DROP rules for the DOCKER-ISOLATION chain in iptables to block bidirectional traffic between test and other networks for the purpose of network isolation. A zero trust model requires that different containers should not communicate with each other by default. For this purpose, users can set the Docker daemon’s startup parameter, –icc=false, so that packets from the FORWARD chain of the iptables will be dropped by default after the daemon is started. When the Docker daemon runs, users need to add appropriate access control policies that fit in with actual business requirements. For Cloud Workload Protection (CWP), such whitelist-based policies are quite important for deployment of mission-critical business environments as they can minimize the exposure surface and restrict connections of unknown business so as to reduce the likelihood of breach. The preceding inter-container access control policies can be created manually by using the —link parameter or the docker-compose command when containers are started. External access to containers on the host is based on such a principle: Container-provided services are accessible via ports that are configured to be exposed to the Internet by using the -p or -P parameter. when and only when containers are started. Arguably, this access control mechanism is specific to hosts, with ports as the granularity of protection. This section uses Docker Swarm as an example to describe the security mechanism for container networks in cluster mode. Put simply, Docker Swarm’s overlay network complies with IETF VXLAN standards for isolation of different subnets. The following illustrates how the isolation and access control mechanism of Docker Swarm’s overlay network works. (1) Set up a cluster environment. Prepare a cluster that contains two nodes. (2) Create two overlay networks. Create two overlay networks, i.e., test0 and test1. Clearly, Docker creates a namespace for each overlay network. Such namespace names begin with “1-” followed by a string which is the prefix of the overlay network ID. For example, the namespace is 1-vn86l7s11g for test0, 1-w9p3tfmr09 for test1, and 1-3cv9ry2rsk for the ingress network. Note that those namespaces are named differently on different posts. Create services, web0, web1, and web2, of which the former two share test0 and the latter uses test1. As shown in the preceding figure, web0.1, web0.2, and web0.3 are container replicas of web0; web1.1 and web2.1 are container replicas created respectively for web1 and web2. web0.1 is the short form of web0.1.u800qsqymguo9avo72w2o3ci0. For the sake of simplicity, suffixes of container instance names are completely removed in subsequent sections. After the environment is set up, you can, based on services, find the network to which containers connect. Take web0 as an example. From the above, we can see that this service connects to the test0 network. At least, container replicas of this service also connect to this network. If this service is provided externally, it will connect to the ingress network. For example, querying the test0 network, we can find the server to which the service is connected. It is clear that a VXLAN tunnel is set up between Docker Swarm and the host. The above test0 network information shows that on top of the underlay network comprising two hosts, 192.168.19.11 and 192.168.19.12, an overlay subnet, 10.0.0.0/24, is built, with the network gateway address of 10.0.0.1 (network address of br0 of the namespace 1-vn86l7s11g). In addition, when both web0 and web1 connect to test0, their container replicas also connect to this network. As network interfaces in the namespace of test0 have no VLAN IDs, no VLAN is set for these interfaces on the network bridge and containers on one host in the same network can access on another without any isolation measures. On computing nodes in OpenStack, different VLANs are set to isolate subnets of different tenants on the network bridge connected to the VXLAN tunnel. 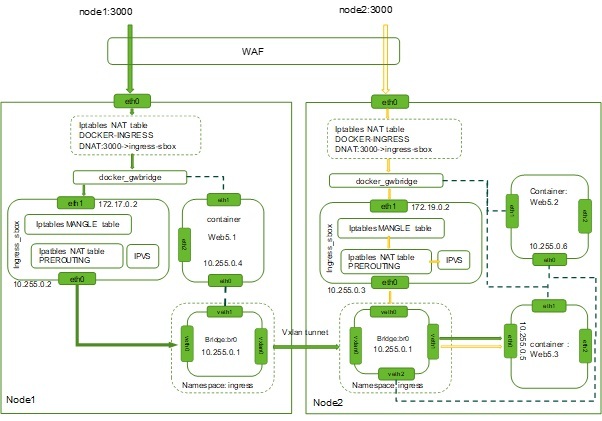 In contrast, in Docker Swarm as shown above, networks are isolated by using network namespaces, instead of VLANs. (4) Control access to containers in a cluster. As previously mentioned, in Docker Swarm, containers in the same overlay network can access one another by default, while those in different overlay networks cannot. There are no customizable access control policies for containers. If access control policies need to be applied explicitly, users need to create them manually. As the -p parameter is selected during service creation, four network interfaces will be created for containers of this service. The eth0 interface connects to the ingress network which acts as an intermediary between external networks and containers. The eth1 interface connects to the docker_gwbridge network. 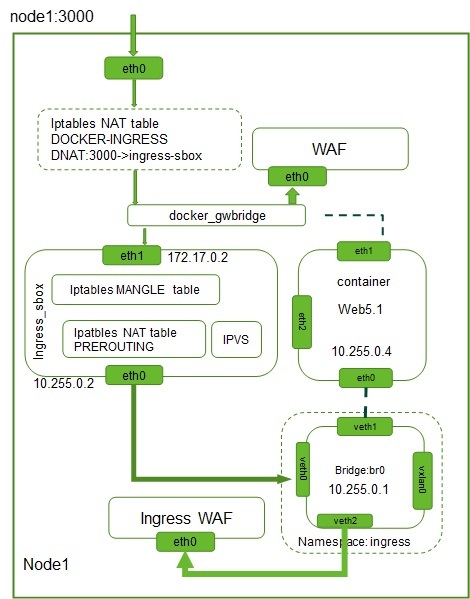 This network provides the communication from containers to an external network. For example, when the ping www.baidu.com command is executed in a container, the traffic will go through the default_gwbridge network. The eth2 interface connects to the test1 network for communications between container replicas across host services. This service is available on port 3000 exposed externally, while the container listens on port 80. External access to port 3000 is achieved through port mapping. Passing through the iptables of the host, the packet arrives at the namespace ingress_sbox after going through the network bridge docker_gwbridge. After IPVS load balancing, the destination IP address will be translated into the IP address of the container for which the packet is destined when being transmitted in the ingress network. It can be seen that to control external access to the service, access control rules can be deployed for data channels between the eth0 interface on the host and the destination container. For example, create access control lists (ACLs) for the DOCKER-INGRESS chain in the iptables table or deploy a firewall outside the host. Of course, whichever method is used, access control rules should be adjusted in light of changes to containers. This requires full integration between the access control management mechanism and the container orchestration system. The following figure shows the external access to port 3000 on node1 and node2. Arrows in green and orange indicate the entire process of packets passing through different host ports to the Web5.3 container. Service software’s transition from individual applications to a lot of container-based microservices brings many benefits and also changes the internal communication mode of software. As for network and security, two noticeable changes are observed: 1. The communication traffic surges horizontally. 2. Borders become much more blurred. Even if each running container can be hardened and a limit can be set on the number of interfaces for external communication, as the total number of interfaces increases dramatically, more opportunities are opened up for network attackers to detect vulnerabilities. Besides, containers can be rapidly deployed within seconds. The container orchestration system can automatically start new containers on one or more hosts according to the actual resource situation. Each container has its own network mapping interface which can be reallocated and unbound in the course of running, especially because containers have a very short lifecycle, with 17% lasting less than one minute and 78% disappearing within an hour[i]. Therefore, container protection should be agile and elastic. Given all above analysis, in a cloud-native environment, cloud-native container firewalls are required to isolate and protect application containers and services. Even if containers dynamically expand or shrink, such firewalls can still detect, track, and protect them. Like traditional gateway firewalls, container firewalls can also protect network communication that is from external networks and traditional applications to the container environment. Micro-segmentation is a kind of segmentation technology which is more fine-grained than traditional segmentation based on network addresses. For example, this technology can implement isolation and segmentation for individual containers, container collections or container applications in the same network segment. With micro-segmentation as an essential feature, container firewalls can perceive layer 7 or the application layer and provide dynamic control of connections, depending on upper-layer applications. We can see that this kind of firewalls implements dynamic micro-segmentation for services and therefore has become the first line of defense to protect containers in horizontal traffic scenarios from malicious attacks. 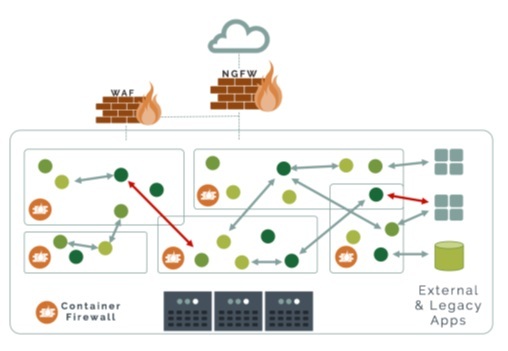 Container firewalls mainly protect inter-container network sessions in horizontal scenarios, and thus will not replace protective systems, like NGFW, IDS/IPS, and WAF, deployed at the entrance of the data center. On the contrary, container firewalls, through collaboration with those traditional firewalls, can effectively block attacks that are initiated from internal applications. Typically, external microservices take the form of web or HTTP applications and services, for example, websites or applications with support for REST APIs. For the sake of security, you can deploy web applications to detect and block malicious HTTP requests. This section describes how to perform cybersecurity protection for web applications. For the security of other applications, see the threat detection section. Microservices can receive traffic from vertical and horizontal directions. Take node1 as an example. As shown in the following figure, the traffic from the external network to the Web5 service is vertical. To protect the traffic, you can deploy a web application firewall on the external network. The container environment also contains a great number of API calls, or even you might say that the traffic of a data center mainly comprises invocation requests and responses of such APIs. Such traffic is called horizontal traffic. To protect the traffic, you need to deploy virtual web application firewalls (vWAF or cWAF) in the internal network of a host. As the container management and orchestration system will create or delete container instances dynamically according to actual business requirements, it needs to connect to the container management and control plane and has vWAF deployed to track dynamic network changes. Take node1 as an example. Web5 connects to the 10.255.0.0/24 and 172.17.0.0/24 networks. 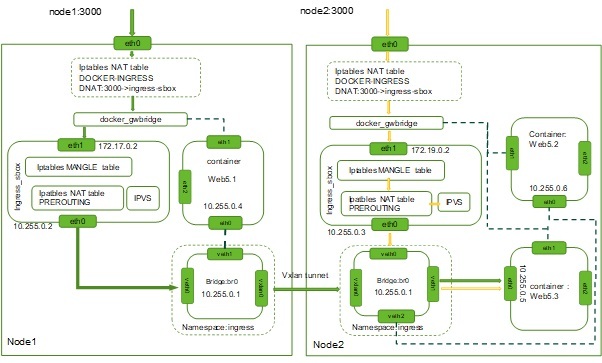 Therefore, for protection of Web5’s container replica (Web5.1 in the following figure) on the node1 host, you can deploy a vWAF respectively at the network bridge docker_gwbridge and the network bridge br0 in the namespace ingress. In this case, vWAF, in out-of-path mode, can detect malicious requests by mirroring traffic, and in in-path mode, can filter traffic for protection. The software-defined networking (SDN) technology can be introduced to implement flexible traffic scheduling so that fewer WAFs need to be deployed for intended security protection. 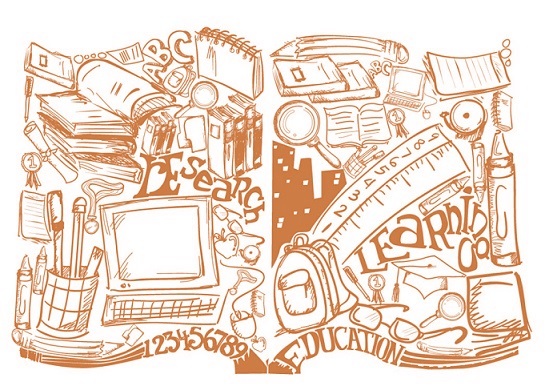 For details, see the 2015 NSFOCUS SDS White Paper[ii]. Each host and server have a container firewall deployed to gain full access to the local Docker daemon. As the container firewall resides within the container network, it can easily detect abnormal behaviors on the container network, especially horizontal inter-container movements of malicious attackers. Also, a machine learning module can be integrated in the container firewall to automatically learn security policies for effective container security protection. Deep inspection of and visibility into container network communications to gain accurate application knowledge for container protection. Host process monitoring, process privilege escalation monitoring, and suspicious process detection. Static scanning or dynamic real-time vulnerability scanning, image repository scanning, host scanning, and vulnerability scanning for running containers. Container audit based on CIS’s security baselines. Capture of raw packets of containers for forensics and debugging. To ensure that containers can be deployed and operate in a secure way, container firewalls should be able to support virtual workloads, automatically learn behaviors of applications, generate smart security policies, and seamlessly integrate with the container orchestration platform. The default startup parameter setting of the Docker daemon, –icc=true, indicates that the inter-container communication is allowed by default. In addition to the loopback interface, containers for the new services provide another two network interfaces, eth0 and eth1. The eth0 interface connects to the network bridge interface of the overlay network test0 or test 1 for inter-container communication across different hosts on the same network. 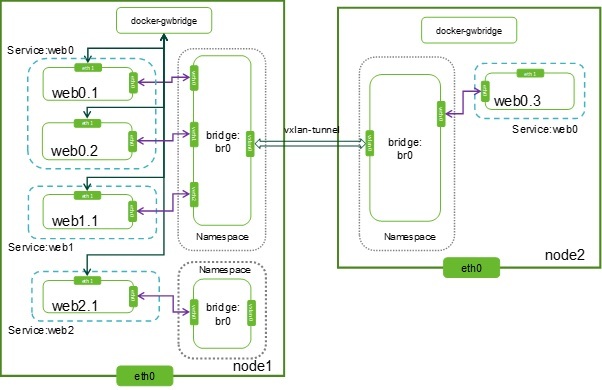 The eth1 interface connects to the docker-gwbridge bridge network for the communication between containers and the host. If –internal is used during the creation of the overlay network, containers for services created with the docker service create –network command, besides the loopback interface, have only the eth0 interface which connects to the network bridge interface of the created overlay network.